Given the weather over the last week it will come as no surprise that both matches today have been called off due to waterlogged pitches. At the moment tomorrow's Veterans game at Bury Rangers is still on, although the chances are that it will suffer the same fate. The pitch at The Bury is waterlogged and we will need a prolonged spell of dry weather to see it fit for use again. 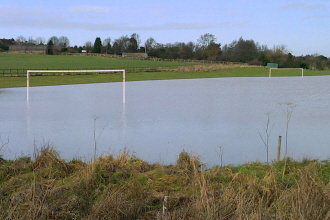 Fortunately, it is not in the same shape as the Hormead Hares' playing surface was on 24th December - as you can see from the picture, the most suitable boots to wear for a game there would be waders!